Since 1946, the Pennsylvania Historical and Museum Commission (PHMC) has administered a historical markers program to capture the memory of people, places, and events that have affected the lives of Pennsylvanians since William Penn founded his Commonwealth. To learn more about how you can apply for a PHMC marker or to search for an existing marker, visit their website. The following list includes the 50+ historical markers located in Erie County, PA.
Marker Text: These skilled crewmen were among those who enabled Oliver Hazard Perry to defeat and capture a British squadron, Sept. 10,1813. Their participation–critical to victory–secured a place for African Americans in the region’s history. Marker Text: A restored blockhouse marking the site of American Fort Presque Isle and the original burial place of General Wayne stands on the Soldiers and Sailors Home grounds near the foot of this street. Wayne died there Dec. 15, 1796. Marker Text: End of Erie Extension of the Pennsylvania Canal system. Work begun here July 4, 1838. Canal formally opened Dec. 5, 1844, by arrival of “R.S. Reed” with Mercer County coal, and “Queen of the West” with passengers. Marker Text: Grave of Captain Gridley, commander of Dewey’s flagship Olympia in the Battle of Manila Bay, 1898, is located in this cemetery. Dewey’s order, “You may fire when you are ready, Gridley,” opened the battle. Marker Text: Erie merchant mariner, naval officer, born in Mifflin County. Captured by the British during the War of 1812, Dobbins escaped, went to Washington to report the fall of Forts Mackinac and Detroit. Appointed a sailing master in the US Navy, he returned to Erie to supervise the construction of a squadron of warships later commanded by O.H. Perry in the Battle of Lake Erie. Dobbins served in the US Navy and Revenue Cutter Service for thirty years. Marker Text: Erected as a residence for the cashier of a branch of the U.S. Bank of Pennsylvania, which occupied the adjacent building. Completed 1839. Under a series of new owners after 1849. Marker Text: America’s most famous clown of the Nineteenth Century, Dan Rice (1823-1900), had the winter quarters of his circus in Girard from 1852 to 1875. The nearby Soldiers’ Monument was donated by the versatile clown and showman, whose home stood opposite. Marker Text: Over 1000 geared steam locomotives were built at the Climax plant here from 1888 to 1928. These were widely used on logging railroads in the United States and other countries. By making new areas accessible to large-scale lumbering, geared locomotives were a key to the industry’s growth. Marker Text: Civil War hero was born at the NW corner of First & Cherry Streets. A major turning point in the 1863 Battle of Gettysburg resulted from his independent and decisive action on July 2 in detaching his brigade (including the 83rd Pa. Regiment) to occupy and defend Little Round Top. Mortally wounded while rallying his men, he died July 7, four days after he had been promoted to brigadier general for gallantry. Marker Text: Judah Colt as Agent began the first Pennsylvania Population Co. development here in 1797, setting up the first organized settlement in Erie County, at head of flatboat navigation on French Creek. Marker Text: Established in 1876 by the Pennsylvania Fish Commission as the ”Western Hatchery,” it is the longest continuously operated fish hatchery in the Commonwealth. Supplied by abundant springs of uniform flow and temperature, it is considered the state’s pioneer trout hatchery. Its success had a positive effect on the state economy, led to the creation of many jobs related to outdoor recreation, and helped stimulate Pennsylvania’s sport-fishing prominence. Location: NW corner of Corry City Park, at intersection of N Center (Rt. 426) & Smith Sts. Marker Text: Concerned about declining wildlife populations caused by logging, development, and excessive hunting and trapping, Corry businessman H.A. Penrose assembled several influential men in Corry on Aug. 22, 1890, to form the Pennsylvania State Sportsmen’s Association (PSSA). This organization promoted wildlife conservation and enforcement of game laws. Efforts of the PSSA led to the creation of the Board of Game Commissioners by Act 187 of 1895. Marker Text: Near Titusville. The Park and Museum are owned by the State. On the site Col. Edwin Drake struck oil Aug. 27, 1859, marking the birth of the petroleum industry. Historical and museum material center. Marker Text: Founded in 1857, it was established in 1861 as a State Normal School, second oldest in the Commonwealth and first west of the mountains. It became a Teachers College in 1926 and a State College in 1960. Marker Text: Established, 1861, as a State Normal School, the second oldest in the State and the first west of the Allegheny Mountains. Was made a Teachers College, 1926. Marker Text: The State’s only lake port, bought with Erie Triangle, 1792. Laid out in 1795 by Ellicott and Irvine. Site of French, British and U.S. forts. Perry built his fleet here in 1813. Marker Text: The State’s only lake port, bought with Erie Triangle, 1792. Laid out in 1795 by Ellicott and Irvine. Site of French, British, and U.S. forts. Perry built his fleet here in 1813. Marker Text: Formed March 12, 1800 from Allegheny County. Named for Lake Erie, which took its own name from the Erie Indians. Erie, the county seat, was laid out 1795; made a city in 1851. Ships of Perry’s fleet which won the 1813 Battle of Lake Erie were built here. Marker Text: Part of the old channel is visible by the present railroad, which replaced the canal. Lockport, now Platea, was founded 1839 at a point where a series of locks, 28 in two miles, lowered boats bound for Erie. Canal open 1844-71. Marker Text: A section of this canal, linking New Castle and Erie, lies at foot of the slope, to left of side road. Conneaut Line, Erie to Conneaut Lake, begun by State, 1838; finished by company headed by R.S. Reed, of Erie, 1843-44. Marker Text: The first lighthouse to shine on the Great Lakes. Created to aid navigation and promote shipping, the original 20-ft. beacon (1818) and the subsequent brick tower (1858) were built upon unstable soil. The sandstone tower (1867) was the 3rd built here. Marker Text: Three forts have stood on this site. French fort, built 1753 to guard road into Ohio Valley, abandoned 1759. British fort, built 1760, burned by Indians, 1763. American fort built to protect settlers, 1794. Marker Text: The Judson House, built in 1820, stands on the site of the old French fort. This was the scene of Washington’s first public mission. Marker Text: Two forts stood four blocks north. French fort, built by Marin, 1753, abandoned, 1759. British fort, built by Col. Bouquet, 1760, and captured by Pontiac’s Indians, 1763. The French Road to Fort LeBoeuf began there. Marker Text: The Riviere aux Boeufs of the French, renamed by George Washington in 1753. It had an important part in the French and Indian War and the settlement of northwestern Pennsylvania. Marker Text: In December, 1753, George Washington came here with notice from the Governor of Virginia to the French that they were trespassing on British soil. The statue shows Washington carrying out his first public mission. Marker Text: Known as the “Dean of American Magicians,” he was mentor and friend to Harry Houdini. Considered the first American magician to become an international star, he performed extensively on five continents, impressing audiences with his elegant theatrical illusions for more than 40 years. He popularized the Vanishing Birdcage effect and perfected the levitation illusion. Born in Erie, he returned to perform many times. His boyhood home stood nearby. 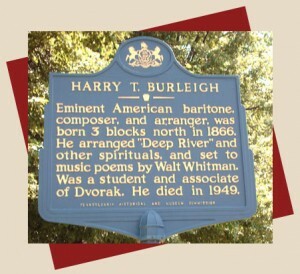 Marker Text: Eminent American baritone, composer, and arranger, was born 3 blocks north in 1866. He arranged “Deep River” and other spirituals, and set to music poems by Walt Whitman. Was a student and associate of Dvorak. He died in 1949. Marker Text: Noted writer; biographer of Lincoln, historian of Standard Oil; born Nov. 5, 1857, in her grandfather’s log home at Hatch Hollow, about two miles to east. She died Jan. 6, 1944, at Bridgeport, Connecticut. Marker Text: Chief Steward & President, United Electrical Workers Union Local 506, 1942-1959. Accused of McCarthy-era Communist activity, he was the first union leader fired by General Electric, 1953. He defended workers’ civil liberties while UE represented him in court. He died prematurely at 42. Marker Text: Lead chemist and manager of Downer Oil Works, built nearby in 1862 following discovery of oil near Titusville. Merrill’s refining breakthroughs included an illuminating oil safer than kerosene for use on railroads and steamships and in factories. He also developed deodorized lubricating oils for machinery, opening new world markets in the late 1860s. Merrill was an award recipient at the 1876 Centennial Exhibition in Philadelphia. Marker Text: The liquefied petroleum gas industry originated in this vicinity. The first domestic customer, John W. Gahring, had “bottled gas” for lighting and cooking installed May 17, 1912, at his farm home about five miles southeast of Waterford at Le Boeuf Station. Marker Text: Built in 1839 to house branch of U.S. Bank of Pennsylvania. Later used as custom house, post office, and G.A.R. hall. Now home of Erie County Historical Society. A famed example of Greek revival architecture. Marker Text: Here the modern highway leaves the course of the Presque Isle Portage, part of the historic Venango Trail. The French Road, built in 1753, following an Indian path, turned down into the valley. Marker Text: The northern boundary of Pennsylvania, before the purchase of the Erie Triangle in 1792, crossed the highway at this point. The State paid $151,640.25 for the Erie tract and its port on the Lakes. Marker Text: The northern boundary of Pennsylvania, before the purchase of the Erie Triangle in 1792, crossed the highway at this point. The State paid $151, 640.25 for the Erie tract and its port on the Lakes. Marker Text: A champion racer during the bicycle craze that swept the United States in the 1890s. After racing locally for several years, he competed against bicyclists from other states and nations in major contests between 1896 and 1906; foremost among these were the six – day team races at the old Madison Square Garden in New York. Maya had lived here as a boy above his family’s business, which he later managed on his return to Erie in 1907. Marker Text: Founded 1681 by William Penn as a Quaker Commonwealth. Birthplace of THE DECLARATION OF INDEPENDENCE and THE CONSTITUTION OF THE UNITED STATES. Marker Text: Perry’s ships, the Lawrence, the Niagara, and the Ariel, were built in spring, 1813, at the foot of this street. His warehouses, blockhouse, and lookout station were also located there. Marker Text: The old portage, part of the historic Venango Trail from Lake Erie to the Ohio River, crossed the modern road here. The early Indian trail became a French military road in 1753, their chief route to the Ohio. Marker Text: Pioneer nurse anesthetist. Born Jeanne Sheridan in Ireland, Sister Bernard entered Saint Vincent Hospital to study nursing in 1877 and developed expertise in anesthesiology. Her work was a landmark in nurse anesthesia education programs nationwide. Marker Text: At 236 E. 11th Street. Founded 1874, this is Erie’s oldest African-American congregation. Five of its first six members were women. Originally at 3rd & German Streets, this church has long ministered to the spiritual and social needs of the Erie community. Marker Text: This is the bowsprit of the Wolverine, originally named the Michigan. Launched in 1843, it was the Navy’s first iron ship. In use until 1923. Only warship on the Lakes for many years.